The first benefit of the abroad experience is you learn to check your privilege, in more ways. Furthermore, living and learning in a foreign country is the first time most of us will experience what it truly feels like to be an outsider. Time and time again it has been proved that there are many tangible benefits of studying, working and interning abroad. Graduates who have lived abroad are more established with highly paid salaries, than their peers. 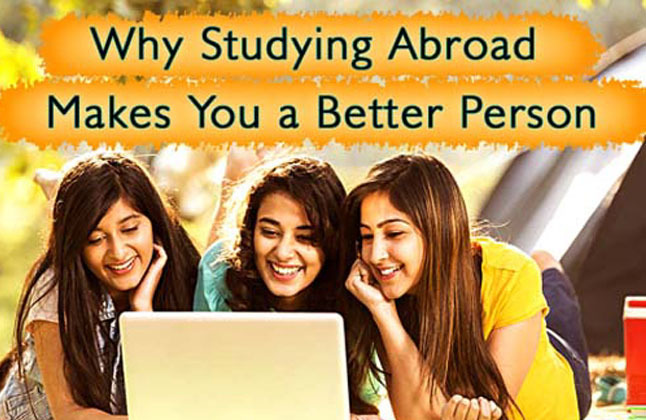 However, there are other benefits of living abroad that shouldn't go unnoticed. Living abroad pushes you out of your comfort zone. It's easy to become comfortable in your place, you study in the same places, know all the best routes around campus, the friends you've known since your first week of college. In a similar ways, the distance provides a valuable sense of perspective on your college life. There are benefits of studying abroad as it provides the time and space to step back and assess what really matters to you. In comparison, moving abroad is scary sometimes. Accents are unfamiliar, food is different and so many other things as well. They might even speak a different language. All these changes can feel unnerving, but a change to your routine will ultimately be rewarding. You might find that the method of studying the university you're studying abroad at is a game changer for you. Or the company that you're interning at might give you an opportunity for training you wouldn't have received at home. It might be something smaller that breaks up your routine. Whatever it is, it is always good to mix up your routine and to challenge yourself to be open to improving your efficiency, work-life balance, and how you spend your leisure. Finally, living abroad makes you check your privilege. For some, living abroad means experiencing a slightly less luxurious way of life and being exposed to a diverse range of people and ways of life. Many people who return from living abroad find themselves inspired to take action in aid of the people that they met abroad. Wherever your time abroad takes you, make sure that it will be a rewarding time, and that you will achieve the benefits for years to come. If you're interested in going on the adventure of a lifetime, and returning a more confident, independent and accepting person, to learn more about opportunities to study, work, intern and volunteer abroad. What Edwise Students Studying Abroad Say? "Experience at Edwise has been tremendous till now. Counselor at Edwise helps not only at professional but also at a personal level. I have always got full support from everyone at Edwise. I'm really happy that i chose Edwise for my future's decisions." "I had a very wonderful experience with Edwise and I want to thank them for helping me throughout the process. " "I am very thankful to Edwise for helping me and guiding me in my academics. Edwise has played an important role in my career." For complete information of Study In Abroad Contact Edwise - Overseas Education Consultants, on 1-800-200-3678 (Toll Free) / 08600911333.